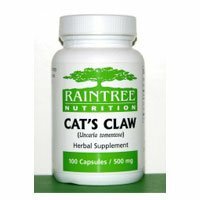 You are here: Home Cat Health And Personal Care Cats Claw Capsules 100 Caps, 500 mg - Raintree Nutrition Inc. Some of the active ingredients documented and researched in cat's claw are 6 oxindole alkaloids. These alkaloids have been documented worldwide by independent research and patented to nutritionally support the Defense mechanism of body. * Is this a "TOA-Free" product? No! The main TOA alkaloid, isorhynchophylline, has been documented and patented to increase immune function (phagocytosis).